In response to the climate and distant mountain views this modern family home is positioned as an L-shape framing a terraced internal courtyard. 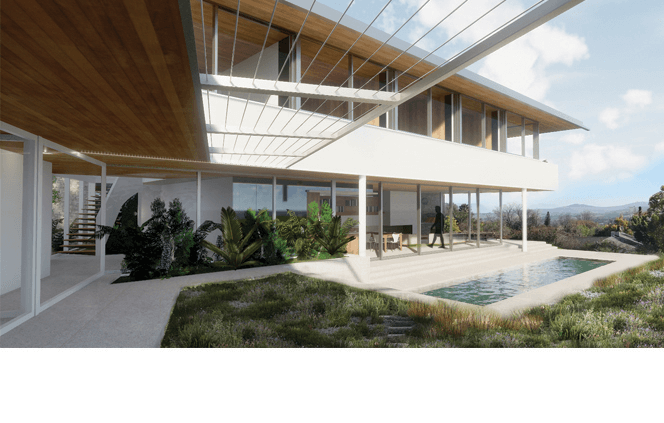 The client has a great passion for the work of architect Richard Neutra and the house is designed in this spirit, taking many cues from his extensive body of work. Emphasis is placed on horizontality and transparency giving the house a seamless connection with the garden. The living areas are placed at the bottom with easy access to the garden whilst the bedrooms are upstairs for safety and security.